The following images demonstrate a flickable being flicked in various directions and the resulting contentX and contentY values. 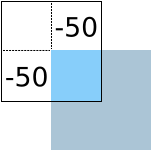 The blue square represents the flickable's content, and the black border represents the bounds of the flickable. The contentX and contentY are both 0. 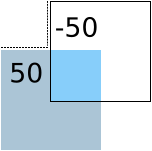 The contentX and the contentY are both 50. 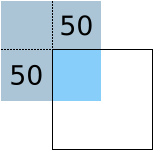 The contentX is -50 and the contentY is 50. The contentX and the contentY are both -50. 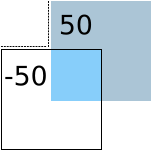 The contentX is 50 and the contentY is -50. See also Examples of contentX and contentY, originX, and originY.